This weekend was the official kickoff to summer in the US as Monday was Memorial Day; a day we remember those who served and died in service to our country. It was a three-day weekend for most of us, and I spent it busy! Friday I helped one of my best friends move. 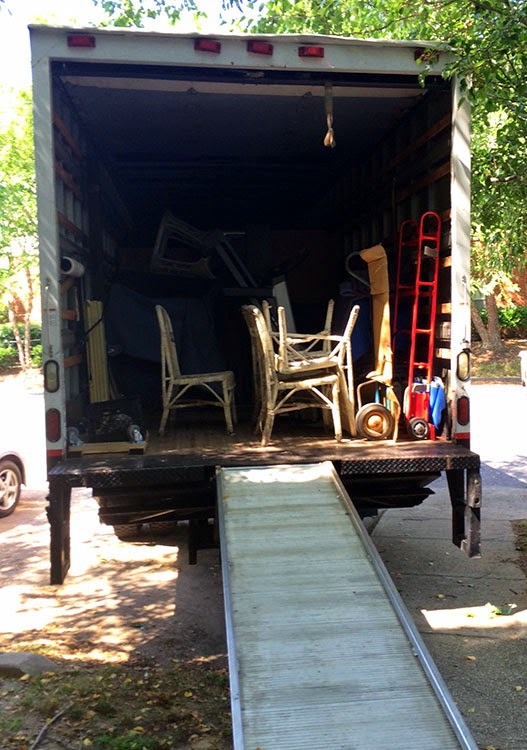 Fortunately, she had movers so there wasn't much for us to do. But, moral support and all that. 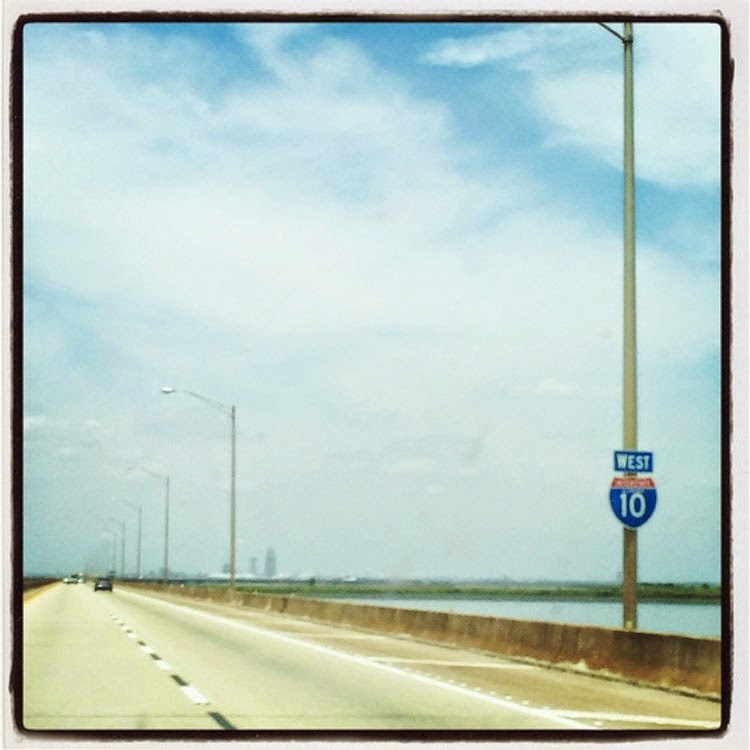 . .
As I live in the direction of the beaches, I got stuck in traffic for over an hour with everyone else that was beach-bound for the weekend. At that point I started to run out of gas and had to just turn around, go to my mom's, and wait for the traffic to subside. No fun! Much of Saturday was also spent working as we went back into Mobile to help my parents paint our old house that needs to sell. We made it back to our side of Mobile Bay just in time to hang out with some friends at a bar-be-que and then went to check out another friend's new bar, Plow in Fairhope. It's awesome! 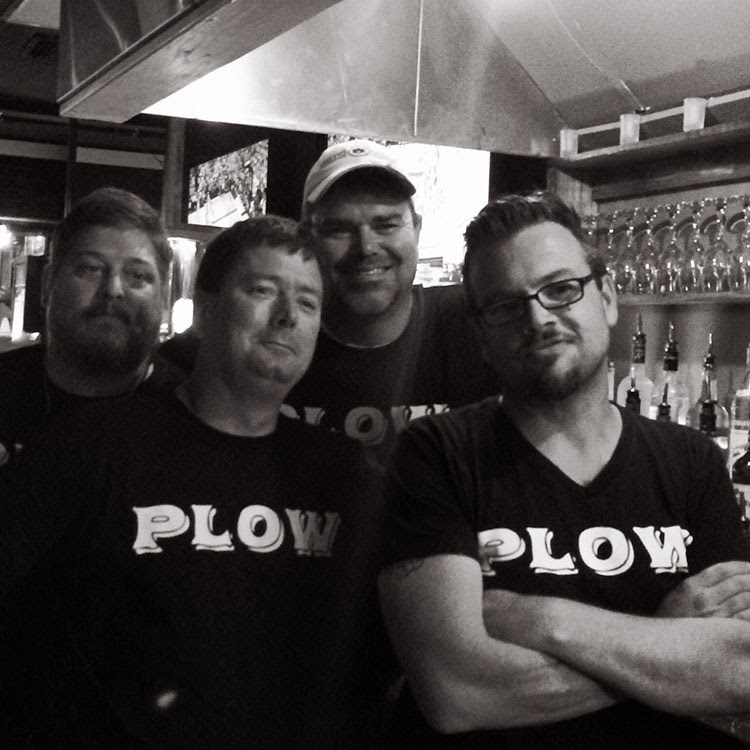 The crew working at Plow Saturday night. Great bunch of guys! After all that, Sunday was slow moving for us. We did make a run by the hardware store on our way down to the beach. Waiting until Sunday afternoon meant that we didn't get much of the traffic. The weather and water was perfect when we finally made it down there. Ahhhhhh. The water was so clear we could see fish and eagle rays without a problem. On Monday, we took care of some tasks around the house. 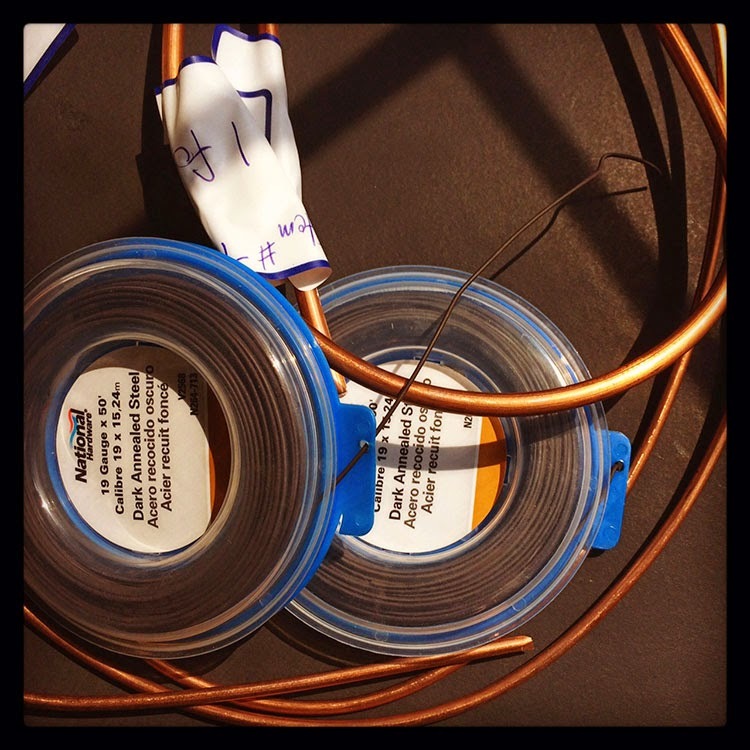 That meant another trip to the hardware store (wire for me!). I got the galvanized on Sunday and the copper Monday. It's some seriously huge gauge! 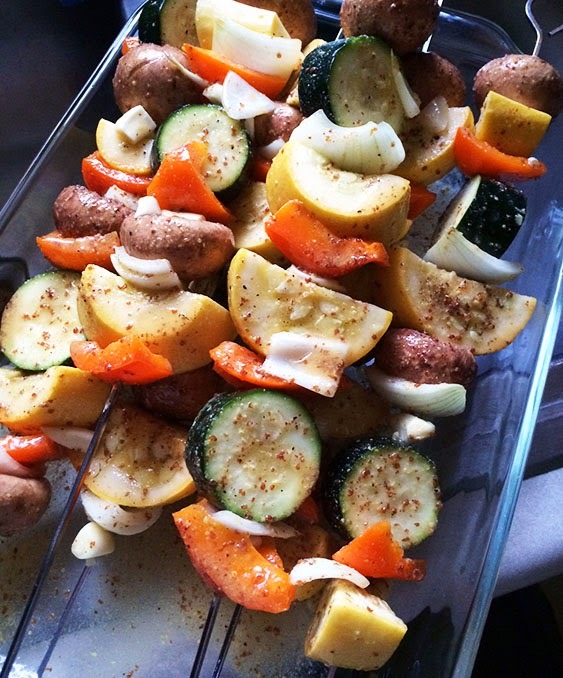 There's mushrooms, squash, zucchini, orange bell pepper, onion, and garlic - all marinated. It was delicious. We've got a shortened work week, but still plenty of busy-ness ahead. As such, the menu is a little scarce. I'm sharing this Menu Plan at I'm an Organizing Junkie. Bowtie lasagna: This was SUPER easy and such a great recipe to add your own spin to. I personally added some diced onion with the ground beef. Pat absolutely loved this, and I found it pretty tasty too. Baked sesame tofu sticks with PB, tahini, and ginger sauce: These turned out really well. I like how firm they came out and can see using them in other recipes. I messed up the sauce as I tried to use PB2 powder instead of natural Peanut Butter. So it was a little runny no matter what I tried to add to make it work. That was my own fault and not that of the recipe though. I will definitely make these again. Now to jump on the rest of the to do list and get on with the week. Here's hoping your week is treating you well! I am so jealous that you live close to a beach. My weekend was spent being dry as it was cold and rainy here. I did get to play in my studio as well as working on the edit for my husband's latest book.